Over many years, human rights and government watchdog organizations have reported on appalling conditions and human rights abuses in immigration detention centers, particularly privately-owned and/or operated facilities. These conditions have included inadequate medical and mental health care, physical and verbal abuse, sexual violence, and punitive disciplinary procedures. Despite these reports, the Trump administration has aggressively sought to expand the US immigration detention system, and nations increasingly mimic the US detention model. In this “virtual brief,” the Center for Migration Studies of New York (CMS) outlines recent detention developments and its relevant publications and resources on detention conditions; privatization of the detention system; and the growth of immigration detention in the United States and globally. The brief also provides statistics on the expansion of this system, despite the problems and abuses that characterize it. The United States has a long history of detaining immigrant families, from detention of European immigrants at Ellis Island and Asian immigrants at Angel Island, to internment of Japanese families during World War II, to the detention of Cuban and Haitian families in Florida and Guantánamo Bay, to the present system of mass detention. Following the September 11, 2001 terrorist attacks, the US government largely abandoned its policies to release families or detain them in family units. Instead, it began to separate children from parents, or detain adults and send their children to family members or other facilities. In “Weeping in the Playtime of Others: The Obama Administration’s Failed Reform of [Immigration and Customs Enforcement] ICE Family Detention Practices,” Dora Schriro offers a brief history of family detention in the United States, summarizes the reforms undertaken both early and late in the Obama administration, and examines the significant challenges the administration faced and the less progressive positions it adopted during its first and second terms. The paper also analyzes the impact of the Illegal Immigration Reform and Immigrant Responsibility Act of 1996 (IIRIRA), and the use of detention to penalize immigrants despite the fact that violation of US immigration law is a matter of civil, not criminal law. The paper concludes with recommendations for transforming the immigration detention system to a truly civil one where the detention system adheres to the civil standards that should govern it and detention must be justified by a legitimate government interest and used only sparingly. IIRIRA has had a devastating impact on immigrants who are detained, indigent, and forced to face deportation proceedings without legal representation. In “The Human Cost of IIRIRA – Stories From Individuals Impacted by the Immigration Detention System,” Saba Ahmed, Adina Appelbaum, and Rachel Jordan tell the stories of individuals — immigration attorneys, an immigration judge, and a detained immigrant and a detainee’s family member — who have personally experienced the impact of IIRIRA. The detained immigrant – a US war veteran who had lived in the United States for 20 years – recounts harsh treatment and deplorable conditions – including inedible food, lack of food, “insanely” expensive phone calls to family members, 20 hour lockdowns, and small, shared cells – during his over 21 months of detention. At one point, after refusing to eat in protest of his conditions of confinement, he was placed in solitary confinement for 30 days. Unable to afford an attorney or find pro bono legal assistance, he was forced to fight his case on his own. Not surprisingly, he lost and was deported. The Board of Immigration Appeals, however, reconsidered his case and sent his case back to the immigration judge for further analysis. Desperate to attend his hearing, the detainee attempted to reenter the United States and was finally admitted, only to be detained again. After a lengthy separation from his family, he was released on bond and continued to fight his case pro se. The immigration detention system requires more extensive review and reform to address its failures and inhumane practices. Increased interest on the part of governments and international bodies in both detention and alternative programs is detailed in “Global Trends in Immigration Detention and Alternatives to Detention: Practical, Political and Symbolic Rationales” by Robyn Sampson and Grant Mitchell. The paper describes the Community Assessment and Placement (CAP) model, a tool which identifies steps that governments can take to prevent unnecessary detention and to improve the effectiveness of community-based, alternative to detention programs. CMS and Migration and Refugee Services of the United States Conference of Catholic Bishops (MRS/USCCB) go further, recommending the dismantling of the US immigration detention system and replacing it with a network of supervised release, case management, and community support programs, designed to ensure court appearances. The CMS and MRS/USCCB report, “Unlocking Human Dignity: A Plan to Transform the US Immigrant Detention System,” urges Congress to commission a comprehensive study on the benefits, challenges, cost, and time frame for creating a civil immigration detention system. The report proposes the creation of a full menu of court compliance programs, with varying degrees of supervision, reporting, oversight and monitoring. By replacing the US immigrant detention system with this alternative structure, immigration enforcement can be made more humane and to honor due process. The report also argues against the oversized role of for-profit prisons in the US detention system, and the extensive use of non-court, process-less removals. Advocates are concerned that ICE continues to outsource management of detention facilities to for-profit prison companies which, in addition to confining immigrants in poor and abusive environments, lack transparency and accountability. Through a point-in-time analysis of a dataset of all persons held in the US immigrant detention system on the night of September 22, 2012, CMS found that 67 percent of all immigrant detainees were in facilities either owned or operated, or owned and operated by for-profit prison corporations. In “Piecing Together the US Immigrant Detention Puzzle One Night at a Time: An Analysis of All Persons in DHS-ICE Custody on September 22, 2012,” Donald Kerwin compares the paper’s findings to an earlier analysis of a similar dataset of all immigrant detainees on the night of January 25, 2009. The paper reports that less than 10 percent of all detainees held on September 22, 2012 had committed violent crimes. In addition, it uncovers problems related to the long-term detention of individuals who had been ordered removed, despite the US Supreme Court holding in Zadvydas v. Davis which seeks to prevent the indefinite detention of persons ordered removed. Unfortunately, in Jennings v. Rodriguez, the Supreme Court recently found that indefinite detention (without the possibility of bond) is not precluded by statute for persons in pending removal proceedings. The study also reveals gaps in Department of Homeland Security (DHS) record-keeping and recommends possible improvements to the overall immigration detention system. In August 2016, former Deputy Attorney General Sally Yates announced a process to reduce – and ultimately end – the federal government’s use of private prison companies to incarcerate persons, stating: “They simply do not provide the same level of correctional services, programs, and resources; they do not save substantially on costs; and…they do not maintain the same level of safety and security.” The memorandum was rescinded by Attorney General Jeff Sessions on February 21, 2017, clearing the way for an even greater role for for-profit prisons in administering federal prisons and immigration detention facilities. The two major private prison contractors – GEO Group and CoreCivic – are also Trump donors, with CoreCivic donating $250,000 to support Trump’s inauguration and GEO Group contributing $475,000 to the inauguration and a Super PAC that supported Trump’s presidential campaign. According to USA Today, because 65 percent of DHS detainees are held in privately-run facilities, the prospect of new government contracts has significantly driven up the value of both companies. From November 9, 2016 to October 2017, GEO Group’s stock price reportedly increased by 63 percent and CoreCivic’s rose by 81 percent. “Immigration Detention, Inc.” by Denise Gilman and Luis Romero describes how for-profit prisons have impacted the immigration system through promoting wide-scale detention, which has led to increased profitability in the private prison sector and increased influence over policymakers. The paper details the mechanisms by which economic inequality dictates the likelihood and length of detention in individual cases, through policies of keeping detention beds full and the use of monetary bond requirements for release from detention. Money plays a significant role in determining the structure and extent of immigration detention and in dictating who is detained and whether and when individuals will be released. The paper offers recommendations for reform, including lessening the use of private prison companies, promoting the presumption of liberty in the immigration detention system to push back against large-scale detention, and reducing the use of monetary bond requirements as a condition of release. The paper also raises troubling issues of democratic governance and the commodification of traditional governmental functions. This is further explored in “Immigration Governance for the Twenty-First Century,” a paper by Ruth Wasem which studies the administration of immigration law and policy with an eye trained on immigration governance for the future. The paper first offers an historical overview of immigration governance in the United States and then breaks down the missions and functions of the Immigration and Nationality Act by the lead agencies tasked with these responsibilities. The paper concludes with an analysis of options for improving immigration governance. On January 25, 2017, shortly after taking office, President Donald Trump issued three immigration-related executive orders, all of which relate to detention in some way. One of them, Executive Order 13767 (“Border Security and Immigration Enforcement Improvements”) directs DHS to “allocate all legally available resources to immediately construct, operate, control, or establish contracts to construct, operate, or control facilities to detain aliens at or near the land border with Mexico.” The order also directs DHS to detain noncitizens to the extent permitted by law and to terminate “catch and release” policies. A few months later, in May 2017, the administration submitted its official budget proposal for FY 2018 (“A New Foundation for American Greatness”) requesting a total of $44.1 billion for DHS with $16.4 billion for US Customs and Border Protection (CBP) and $7.9 billion for ICE. The proposal also included a request of $3.6 billion for custody operations and $2.7 billion (an increase of almost $1 billion) to expand detention capacity for a total of 51,379 detention beds per night. Subsequently, on March 23, 2018, President Trump signed the $1.3 trillion spending bill for FY 2018 passed by Congress the night before. 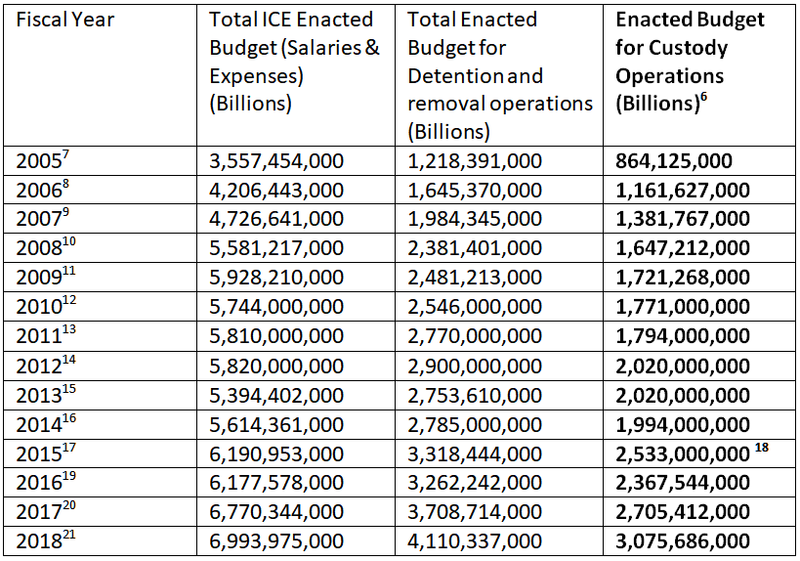 The bill funds less than originally requested by the administration, giving $6.9 billion for ICE of which $4.1 billion will be designated for enforcement, detention, and removal operations. The money to ICE also funds 40,520 detention beds – an increase of 1,196 from the average daily population target in FY 2017 but 10,859 less than the administration’s request. In the administration’s FY 2019 budget priorities (“Efficient, Effective, Accountable: An American Budget”) released in February 2018, the administration has requested $46 billion for DHS including $2.5 billion for detaining up to 47,000 immigrants on a daily basis. 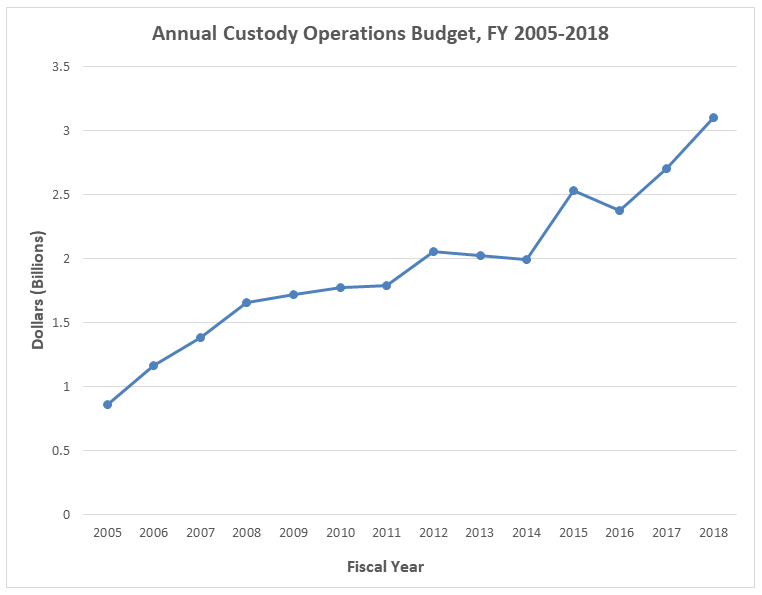 Table 1 and Figure 1 reveal that, from FY 2005 to 2018, there has been a steady increase in annual budget allocations to custody operations. 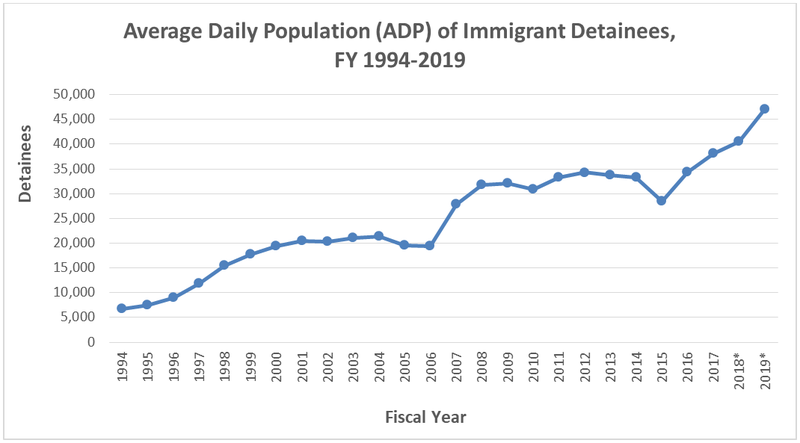 Table 2 and Figure 2 below show the actual average daily population (ADP) of immigrant detainees from FY 1994 to 2017. The numbers for FY 2018 and FY 2019 are the ADP levels DHS aims to achieve in each year. 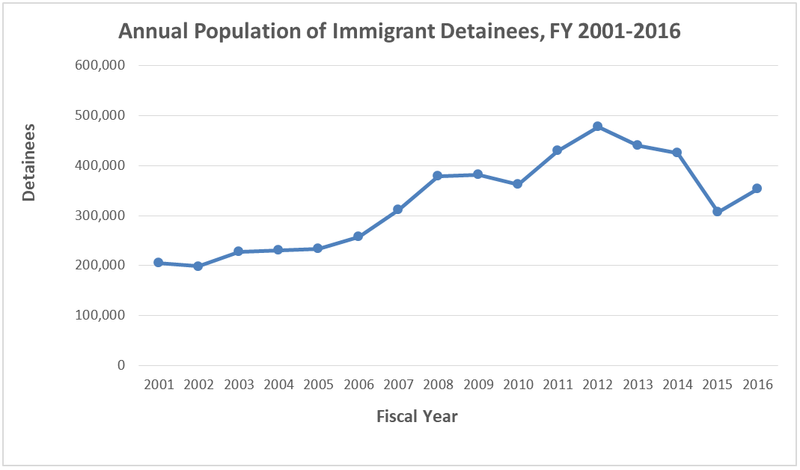 The growth of annual immigrant detainees, as depicted in Table 3 and Figure 3 below, corresponds with the overall growth of the immigration detention system. Note that data for FY 2017 is not yet available. An October 2017 investigation by USA Today revealed that DHS/ICE have begun searching for possible detention sites in Chicago, Detroit, St. Paul, Salt Lake City and southern Texas, according to notices on a federal contracting website. ICE stated that these requests for information are intended to obtain market information and, although not yet finalized, are in line with the additional $1.2 billion for custody operations in the 2018 budget. Unsurprisingly, the government’s ambitious effort to expand the immigration detention system is opposed by immigrant rights and advocacy groups. On October 26, 2017, 13 legal service providers and immigrant advocacy organizations sent a letter to ICE calling for the agency to abandon its efforts. The groups argued that the vast majority of detainees will not have meaningful access to counsel, and expansion will endanger detainees. A range of new, non-state actors have become involved in immigration detention in recent years. In the paper, “Kidnapped, Trafficked, Detained? The Implications of Non-state Actor Involvement in Immigration Detention,” Michael Flynn assesses these new actors, describes the motivations driving their engagement in immigration enforcement, and offers recommendations to manage international migration more humanely. The United States in particular has played an important role in encouraging the global expansion of immigrant detention. In the paper, “There and Back Again: On the Diffusion of Immigration Detention,” Flynn also examines how the process of policy innovation, imitation, and imposition has helped give rise to immigration detention worldwide. Finally, Sampson and Mitchell’s report, “Global Trends in Immigration Detention and Alternatives to Detention: Practical, Political and Symbolic Rationales,” (mentioned above) looks at the increasing use of immigrant detention in various countries but also describes a growing interest in pursuing alternative programs to this practice. Zadvydas v. Davis, 533 U.S. 678 (2001). Jennings v. Rodriguez, 583 U.S. ___ (2018). The memorandum from Deputy Attorney General Yates referred to the Federal Bureau of Prisons’ existing contracts with private prison companies for the incarceration of federal inmates, not immigration detention. As described by the American Immigration Lawyers Association, ““catch and release’ is an unofficial term for the government practice of releasing people apprehended at the border while their cases are waiting to be heard in immigration court.” http://www.aila.org/infonet/immigration-policy-update-catch-and-release. Budgets for FY 2005 to FY 2017 have been enacted. On March 23, 2018, President Trump signed into law the Consolidated Appropriations Act of 2018, the omnibus spending bill for FY 2018. DHS, Budget in Brief Fiscal Year 2019 (Washington, DC: DHS, 2018), https://www.dhs.gov/sites/default/files/publications/DHS%20BIB%202019.pdf. US House of Representatives. 2018. “Division F — Department of Homeland Security Appropriations Act, 2018.” Washington, DC: US House of Representatives. 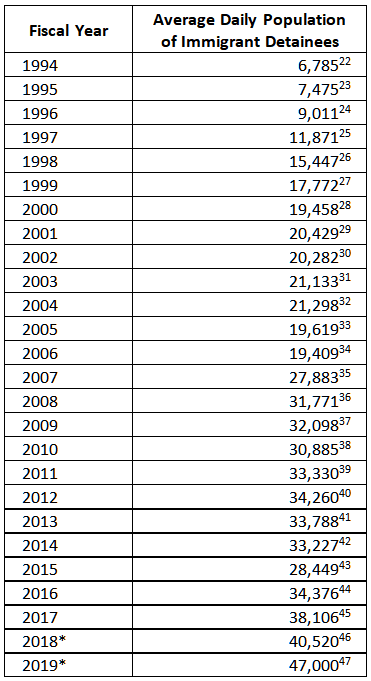 For average daily population for FY 2014-2019, see DHS, “U.S. Immigration and Customs Enforcement Budget Overview; Fiscal Year 2019 Congressional Justification,” https://www.dhs.gov/sites/default/files/publications/U.S.%20Immigration%20and%20Customs%20Enforcement.pdf. Federal Agency Mail Management Act of 2017, Pub. L. No. 115–85, 131 Stat. 1274 (2017). CMS convened a panel of diverse experts to discuss the future of the US immigrant detention system, ideas for and barriers to reform, the system’s growing privatization, the experience of family detention in Texas, and cross-cutting issues and lessons from the criminal justice and national security field.